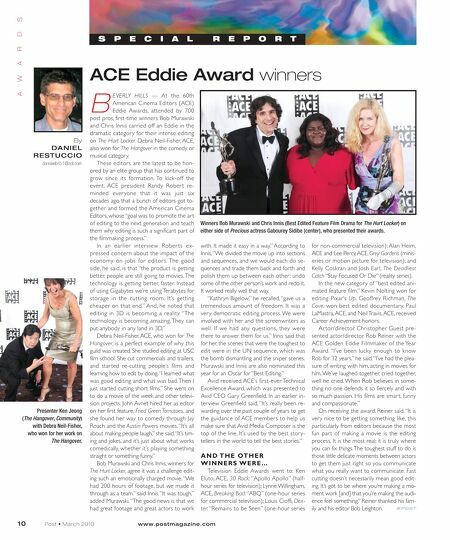 B EVERLY HILLS — At the 60th American Cinema Editors (ACE) Eddie Awards, attended by 700 post pros, first-time winners Bob Murawski and Chris Innis carried off an Eddie in the dramatic categor y for their intense editing on The Hurt Locker. Debra Neil-Fisher, ACE, also won for The Hangover in the comedy or musical category. These editors are the latest to be hon- ored by an elite group that has continued to grow since its formation. To kick-off the event, ACE president Randy Rober t re- minded ever yone that it was just six decades ago that a bunch of editors got to- gether and formed the American Cinema Editors, whose "goal was to promote the art of editing to the next generation and teach them why editing is such a significant part of the filmmaking process." In an earlier inter view Rober ts ex- pressed concern about the impact of the economy on jobs for editors. The good side, he said, is that "the product is getting better, people are still going to movies. The technology is getting better, faster. Instead of using Gigabytes we're using Terabytes for storage in the cutting room. It's getting cheaper on that end." And, he noted that editing in 3D is becoming a reality. "The technology is becoming amazing. They can put anybody in any land in 3D." Debra Neil-Fisher, ACE, who won for The Hangover, is a perfect example of why this guild was created. She studied editing at USC film school. She cut commercials and trailers, and star ted re-cutting people's films and learning how to edit by doing. "I learned what was good editing and what was bad. Then I just started cutting short films." She went on to do a movie of the week and other televi- sion projects. John Avnet hired her as editor on her first feature, Fried Green Tomatoes, and she found her way to comedy through Jay Roach and the Austin Powers movies. "It's all about making people laugh," she said. "It's tim- ing and jokes, and it's just about what works comedically, whether it's playing something straight or something funny." Bob Murawski and Chris Innis, winners for The Hurt Locker, agree it was a challenge edit- ing such an emotionally charged movie. "We had 200 hours of footage, but we made it through as a team." said Innis. "It was tough," added Murawski. "The good news is that we had great footage and great actors to work with. It made it easy in a way." According to Innis, "We divided the movie up into sections and sequences, and we would each do se- quences and trade them back and forth and polish them up between each other ; undo some of the other person's work and redo it. It worked really well that way. "Kathryn Bigelow," he recalled, "gave us a tremendous amount of freedom. It was a ver y democratic editing process. We were involved with her and the screenwriters as well. If we had any questions, they were there to answer them for us." Innis said that for her, the scenes that were the toughest to edit were in the UN sequence, which was the bomb dismantling and the sniper scenes. Murawski and Innis are also nominated this year for an Oscar for "Best Editing." Avid received ACE's first-ever Technical Excellence Award, which was presented to Avid CEO Gary Greenfield. In an earlier in- terview Greenfield said, "It's really been re- warding over the past couple of years to get the guidance of ACE members to help us make sure that Avid Media Composer is the top of the line. It's used by the best stor y- tellers in the world to tell the best stories." A N D T H E OT H E R W I N N E R S W E R E … Television Eddie Awards went to: Ken Eluto, ACE, 30 Rock: "Apollo Apollo" (half- hour series for television); Lynne Willingham, ACE, Breaking Bad: "ABQ" (one-hour series for commercial television); Louis Cioffi, Dex- ter: "Remains to be Seen" (one-hour series for non-commercial television); Alan Heim, ACE and Lee Percy, ACE, Grey Gardens (minis- eries or motion picture for television); and Kelly Coskran and Josh Earl, The Deadliest Catch "Stay Focused Or Die" (reality series). In the new category of "best edited ani- mated feature film," Kevin Nolting won for editing Pixar's Up. Geoffrey Richman, The Cove, won best edited documentar y. Paul LaMastra, ACE, and Neil Travis, ACE, received Career Achievement honors. Actor/director Christopher Guest pre- sented actor/director Rob Reiner with the ACE Golden Eddie Filmmaker of the Year Award. "I've been lucky enough to know Rob for 32 years," he said. "I've had the plea- sure of writing with him, acting in movies for him. We've laughed together, cried together, well he cried. When Rob believes in some- thing no one defends it so fiercely and with so much passion. His films are smar t, funny and compassionate." On receiving the award, Reiner said, "It is ver y nice to be getting something like, this par ticularly from editors because the most fun par t of making a movie is the editing process. It is the most real; it is truly where you can fix things.The toughest stuff to do is those little delicate moments between actors to get them just right so you communicate what you really want to communicate. Fast cutting doesn't necessarily mean good edit- ing. It's got to be where you're making a mo- ment work [and] that you're making the audi- ence feel something." Reiner thanked his fam- ily and his editor Bob Leighton. ACE Eddie Award winners Presenter Ken Jeong (The Hangover, Community) with Debra Neil-Fisher, who won for her work on The Hangover. 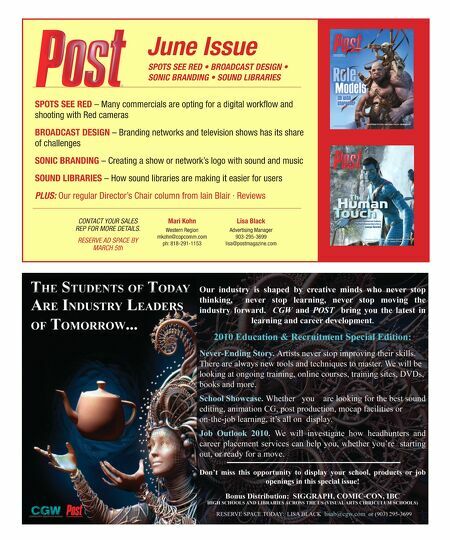 10 Post • March 2010 www.postmagazine.com S P E C I A L R E P O R T A W A R D S By DANIEL RESTUCCIO dansweb451@aol.com Winners Bob Murawski and Chris Innis (Best Edited Feature Film Drama for The Hurt Locker) on either side of Precious actress Gabourey Sidibe (center), who presented their awards.